Not got the faint hearted but well worth the money as it was a great experience. Guided hike up through the falls. 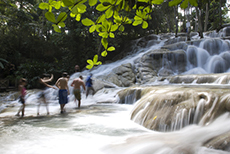 Dunn&apos;s River Falls was so crowded. Experience the rain forest and a beautiful waterfall all in one!! Experience the rain forest and a beautiful waterfall all in one!! It is unforgettable and breathtaking. The chairlift ride, bobsledding and Dunn&apos;s River Falls were great. The chairlift ride, bobsledding and Dunn&apos;s River Falls were great. Highly recommended. The buzz kill was the 1.5 hour ride from Montego Bay to Ochoa Rios. We had a wonderful day at Dunns River Falls. Good excursion, but very rushed. Good excursion, but very rushed. Didn&apos;t even have time on the Island to buy a souvenir. LOVED the excursion. But we were extremely rushed through it. The guide said the cruise ship let us off the ship later than usual. Great courier / guide, great experience. Loved the waterfalls! Make sure you have water shoes! Too many people - felt like being herded like cattle. Too many people - felt like being herded like cattle. Could not keep up with tour guide. Drive back escorted by police was horrible - our lives were in danger from the speeding, almost side swiping cars, etc. Beautiful falls and great guides! Beautiful falls and great guides! Is a little strenuous so you need to be in pretty good shape. Can be slippery on the rocks. Avoid the shops after the falls - so very pushy. Great lunch included with the excursion. I&apos;m 65 and wasn&apos;t sure I could do the climb to the falls but with the help of the guide and the human chain I made it without incident. It was a fun and beautiful experience. The ride to the falls ruined our experience. You get wet so prepare yourself. We took a trip to include Dunns Falls, Blue Hole and river tubing. It was an OK excursion.